How do we design a Passive House? A Passive House is a performance standard not a design standard, so excellent contemporary design with clean lines and functional living spaces can be achieved whilst still meeting the strict certification criteria. The total primary energy demand = the total amount of energy required for water heating, space heating, cooling, ventilation and electricity for appliances. 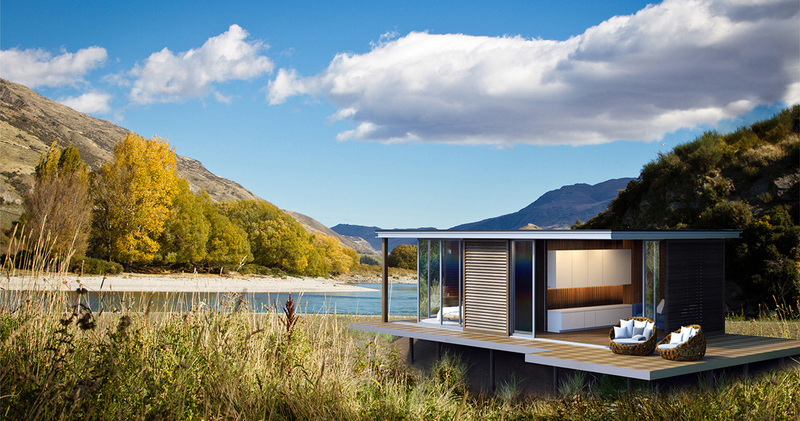 There are five key elements we need to consider when designing a Passive House to suit New Zealand’s unique environment. All principles in a Passive House rely on a good design that optimises the use of natural resources for thermal comfort. To achieve this, it is critical to locate services and living areas in the right place and orientation, whilst not compromising the client’s requirements. 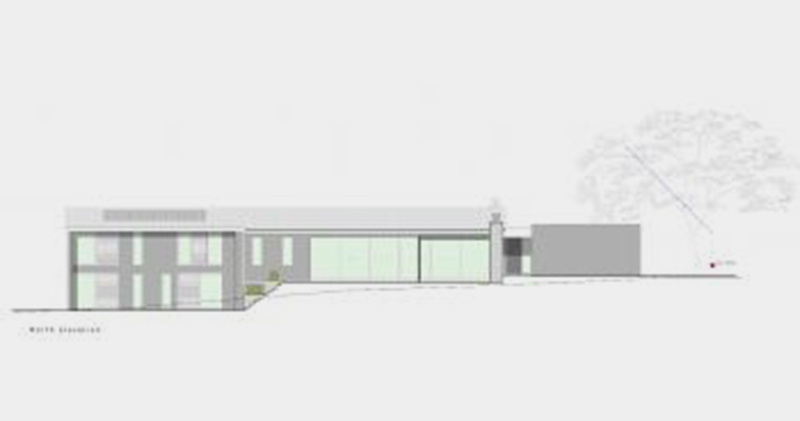 Careful planning from the outset is essential and the first point we consider is setting out the house in the best possible location on the site. To make the best use of passive solar gain we ensure that the building is out of the shade of other buildings/trees, optimise the number and size of the north-facing windows, include wide overhangs to shade the windows in the summertime when heating is not required and incorporated moveable shutters. Other design elements to consider are: the removal of any unnecessary projections or corners and determining the boundary of the heated area of the home and designing it to have a compact layout. Heat retention is realized through specific construction methods like increased insulation, thermal bridge-free structures, an airtight building envelope, energy efficient windows and a controlled ventilation system. To make the best use of passive solar heat gain, the sun’s rays must hit the windows in winter when there is a need for heat input but be shaded in summer by wide eaves. Eco-windows’ double glazed windows were specified in this design which use low-e glass and thermally insulated frames. 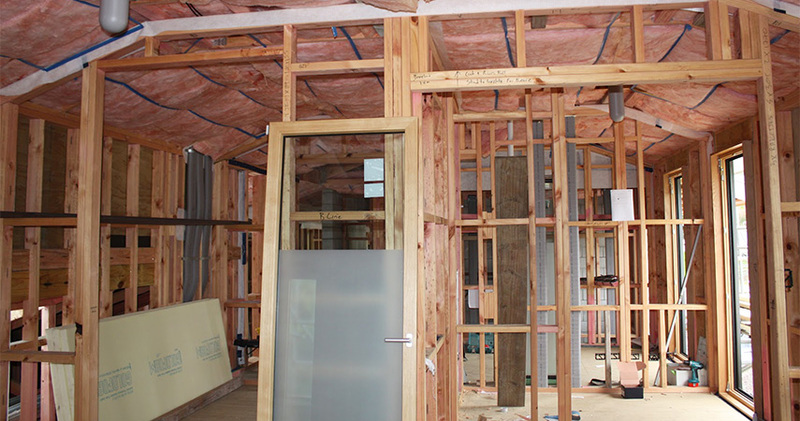 In a Passive House, the entire envelope of the building is well insulated – the walls, windows, roof and floor. This ensures that heat is not lost in winter and keeps indoor temperatures lower during the summertime. High levels of insulation enable a building to retain heat so Passive Houses generally have thicker walls than in traditional construction. We include a double cavity in the walls and ceiling by constructing a Rondo galvanised steel frame (essentially a false frame) to house the second layer of insulation. Using this Rondo frame also reduces thermal bridging and provides a cavity in which the services are run. 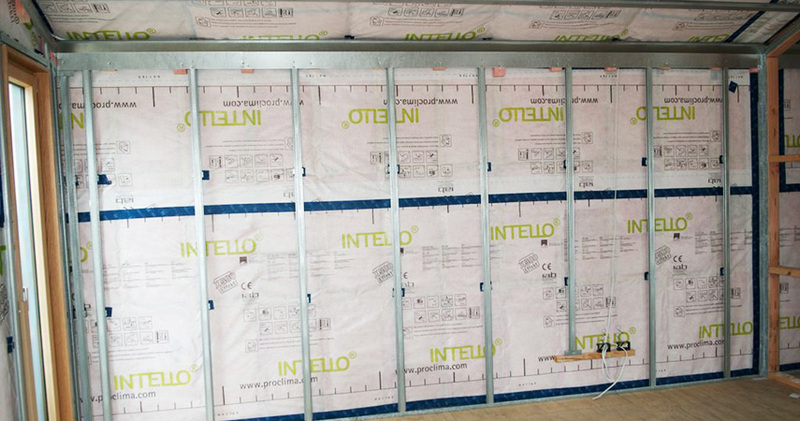 ‘Intello’ membrane (building paper) is fitted between the two layers of insulation to ensure an airtight barrier is achieved. In the exterior walls of the building, through specific design of structural connections and by insulating under the floor slab and footings, thermal bridging is practically eliminated. This ensures that the interior temperature of the building is not affected by the exterior conditions. Thermal bridges are points where heat can be transferred from one element to another. This heat transfer generally occurs between the floor slab and the ground, at corners, connections, windows and where insulation is interrupted. They can lead to about 10-15% of the loss of heat in traditional buildings, so eliminating thermal bridges can significantly influence the thermal performance of a house. Insulating the floor slab and footings i.e. separating the concrete structure from the ground. 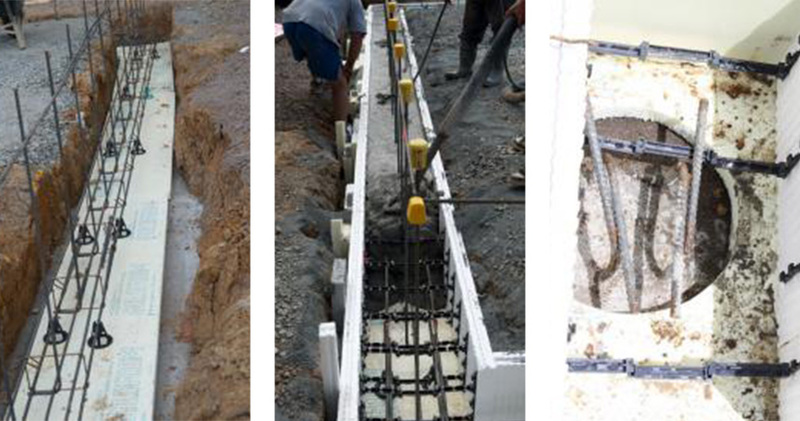 Once the reinforced piles are poured to bear solid ground, 50mm thick ‘Goldfoam’ (extruded polystyrene) boards are laid to insulate and thermally break the footings from the ground and lower concrete foundations. Holes are cut in the boards above the pile points to enable the reinforcing bar to be tied in. Then reinforcing steel cages are set up and insitu concrete is pumped into ‘Eco-block’ formwork, gently vibrated into place and trowelled off. Eco-blocks are made from expanded polystyrene are used as the formwork for the strip footings and concrete floor slab edge and again prevent thermal bridging by separating the structure from the ground. The concrete floor is again insulated by pouring insitu concrete onto ‘EXPOL’ insulation boards made from 100mm thick EPS polystyrene. These lie on top of a continuous layer of polythene over a layer of compacted sand on top of porous hardfill. Sealing the building reduces energy consumption by optimising the control of the mechanical ventilation system and eradicates damp, rot and mould problems. This is achieved by specifying a new membrane product (building paper) that eliminates the air transition between the outside and inside of the house. Airtightness describes how non-draughty the building structure is. Contrary to previous belief, it is now considered hugely important to to achieve an airtight building envelope. Draughts are not only uncomfortable but can lead to mould and rot and contribute to significant heat losses. Constructing an airtight barrier prevents structural damage, improves sound protection and saves energy by ensuring that the ventilation system operates most efficiently. This is achieved by wrapping the whole building with ‘Intello’ variable humidity airtightness membrane (building paper). This includes placing membrane along all the connections between various building elements i.e between walls/window and walls/ceilings, taping all joins in the membrane and taping around all services that protrude through it. 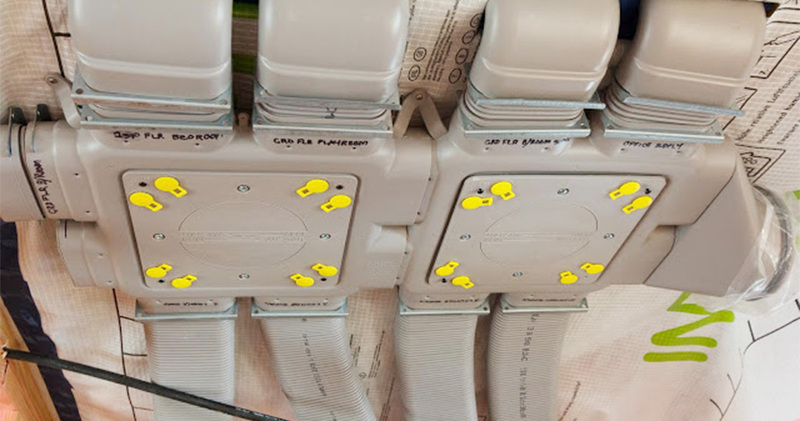 A building’s airtightness is measured during construction by a ‘blower door’ pressure test which is a test performed by creating a positive pressure, followed by a negative pressure, and measuring the total leakage. Any leaks detected can then be sealed. The ventilation system plays an important role in Passive House design and must be carefully designed and laid out. It provides clean and pollen/dust-free air and eliminates moisture and odours where they occur. Further to minimising the loss of heat through structures and windows, the combination of passive heating and heat recovery from ventilation air provides almost all of the heating. Heat recovery from exhaust air is indispensable and reduces ventilation heat losses by passing the warm stale, indoor air over the cold fresh incoming air inside a heat exchanger which brings it almost up to room temperature. A high quality system can pass on over 90% of the heat recovered from exhaust air greatly minimising energy consumption. It is important in the planning stage to determine the shortest duct runs and a compact heat pump is recommended to provide for any additional space heating. The selected Heat Recovery Ventilation System (HRVS) – ComfoAir 550 is manufactured by Zehnder in Germany and was considered throughout the detailing of the construction. The above photographs shows the ‘hub’ of the system and the ducting which service all rooms of the house.